I was 24 years old, attending a PhD program in English, teaching college-level composition, and living with my then-boyfriend… and I wasn’t sure I wanted to be doing any of it. I felt anxious, confused, stressed, and sleepless. I didn’t know how to untangle what was bothering me or how to make changes that would bring me back into balance. But as I wrote in my journal about my woes, I began to connect to my inner voice and find the answers inside. Fast forward two decades, and I remain committed to journal writing (even though I didn’t keep my commitments to the PhD program or to the boyfriend…). Not only that, but journal writing has now become one of the trendiest self-care practices, right up there with meditation and forest bathing. Scientific evidence keeps piling up that regularly writing in your journal can pay off big time in terms of your emotional and physical health. 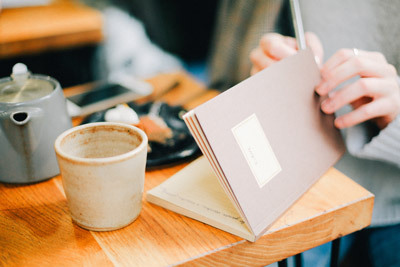 This recent article in the New York Times notes that journaling boosts mindfulness, memory, and communication skills. Not only that, but writing in a journal can improve your sleep and your self-confidence. Journaling can boost your immunity, and if you’re sick or injured, writing about it can help you heal faster. Journaling can also help you move past emotional trauma and boost your mood. That’s especially impressive given that all it takes is your pen and a blank piece of paper. There’s no cost, no prescription, and no side effects! I’m such a proponent of journaling that I’ve decided to add journal facilitation to my menu of services. I’m currently training with the Center for Journal Therapy to learn techniques to help guide you in your journaling journey. Stay tuned for more details!